This is an original composition I've created for helping you learn how to play the 12 bar blues in the key of G. I've written up two solos for this lesson that will sit right in the intermediate category. 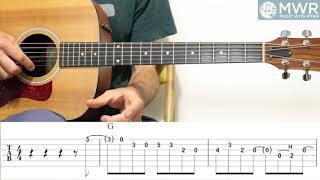 We'll use lots of minor and major pentatonic licks plus we'll be exploring the fretboard as well. This is a great lesson for blending bluegrass, folk, and blues all together. It's a lot of fun to play and there will be many takeaways you can use in other tunes. Have fun and enjoy!